Melukote in Mandya district of Karnataka is a sacred Srivaishnava centre where the great saint Sri Ramanujacharya spent his early years after coming to Karnataka from the Chola country. 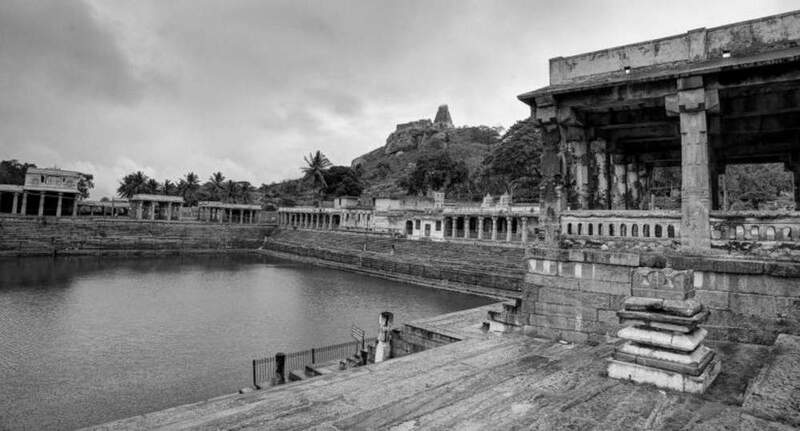 If a general view of Melukote is taken, two landmarks become most conspicuous by their location and they are the Narasimha hill and the Kalyani or the pushkarini. The beautiful holy water tank or the pushkarini is just at the western foot of the Narasimha hill. As a matter of fact, it is the main source of water supply to the entire town even today. The pushkarini is considered sacred because of the belief that the great saint Sri Ramanujacharya used to take bath here when he was living at this place. Hence, a ritual dip in this pushkarini is considered sacred. Because of this sacred nature, a large number of minor shrines and mandapas were built around this tank in recent years, for the performance of various temple rituals and festivals. 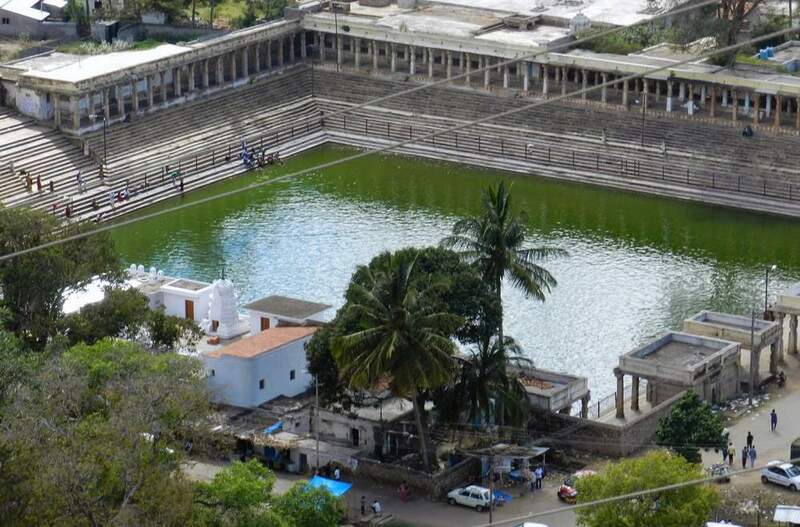 The pond itself is almost square each side measuring 300 ft. On all the four sides are neatly built stone steps leading to the water of the kalyani. Of all the mandapas and shrines that are built on the border of the pushkarini, the prominent place goes to the Bhuvaneshwari mandapa. It is an elegant octagonal structure built over eight tall and slender pillars. This is an open pavilion with a broad and crisp eave running all-round. Over this is a parapet with decorations and niches and it is surmounted by a stucco tower in the centre. This was constructed at the order of Krishnaraja Wadeyar III in the early part of the 19th century. Though small, it is very elegant and has added a rare charm to the pushkarini. Ahobila matha on the northwestern corner has an image of Lakshminarasimha installed in the 19th century. To the east are two more mandapas by the side of a sacred pipal tree. To the western side is what is called Pancha Bhagavatha mandapa. On the northern side is a small cell wherein is placed Adishesha. Then there is another mandapa with over fifty pillars. Then there are four more mandapas where the kalyanotsava of the deity Narayana takes place. Then there is a Nagavalli mandapa and a Varaha mandapa. By its side is the Bindu Madhava temple with a five feet image of the god holding sankha, chakra, gada and padma. The image seems to be of the Hoysala period. The other structures are Parakala matha, Venkataramana temple, Kanchi matha and Rama temple. Thus, the pushkarini is not only beautiful but also has many mandapas where many rituals take place.